Rep. Giffords Makes Public Appearance : The Two-Way "She did not look sick at all," ABC News' Gina Sunseri says of Rep. Gabrielle Giffords (D-AZ) after the congresswoman's first public appearance before a large crowd since being shot and critically wounded on Jan. 8. 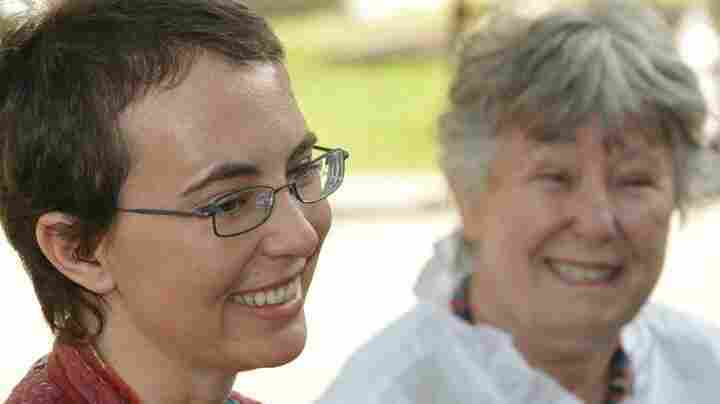 Taken on May 17, this photo of Rep. Gabrielle Giffords (left) and her mother, Gloria Giffords, was posted on her Facebook page on June 12. "She did not look sick at all," ABC News' Gina Sunseri says of Rep. Gabrielle Giffords (D-AZ) after the congresswoman's first public appearance before a large crowd since being shot and critically wounded on Jan. 8. Giffords attended an awards ceremony in Houston Monday night at which her husband, retiring NASA astronaut Mark Kelly, was honored. Sunseri was at the event and says the 41-year-old Giffords "was in a wheelchair, but she was very animated. She was smiling. She was chatting with the people who were sitting next to her." When Kelly was given the Space Flight Medal, "she stood up, she hugged him and she kissed him." ABC News says there were no video cameras at the ceremony. Six people were killed and another 13, including Giffords, were wounded when a lone gunman attacked an event she was holding in Tucson, Ariz.